Step over BB Cream. It is time for CC Cream to take over the pedestal. You probably already notice that. If you haven't, it's just the matter of time. 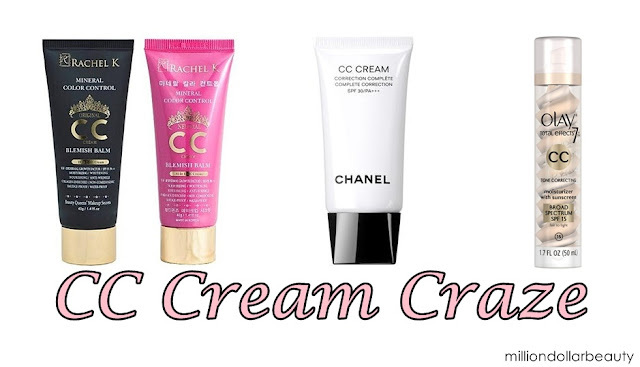 Big brands like Chanel, Olay, and Rachel K are heavily promoting their new CC Cream. Rumour says that more big player such as L'Oreal is coming up with their own CC Cream soon. So what is this CC Cream about? What's the difference between BB Cream and CC Cream? Which one suits my skin better? What it is.... Original name is called "Blemish Balm". Original name is called "Color Correction"
function is to provide sun screen. can be worn as it is too. Do you get a better idea from the chart? I hope it is helpful for you. I'm quite interested to try out the CC Cream, however I just can't decide which one to go for because I have not tried any of it. Have you tried CC Cream before? Which brand are you using? Is it good? almost same with the bb cream. @íм χшËî : I'm actually eyeing on the Chanel CC cream but I haven't gone to the counter to try it. Will do that soon. Not long from now, there will be DD and EE and FF and ZZ cream.. hehehe.. I can't wait to know what is after ZZ cream!!! @Jessying : There's no AA cream yet. Maybe they'll come up with that. This is a great post! I was wondering about the difference between the two - Thanks for all of the information!